The SU8200 FE-SEM is equipped with a novel CFE gun which employes Hitachi's patented "Mild Flashing" technology and a new vacuum system, minimizing gas mulecule deposition on the emitter tip. Hitachi's next generation Cold Field Emission SEM offers unmatched low-voltage imaging and comprehensive analytical microanalysis with the uncompromised performance of CFE. The 8200 Series FE-SEM employs a novel cold field emission (CFE) gun for improved imaging and analytical performance. The newly designed Hitachi CFE gun complements the inherent high resolution and brightness of conventional CFE with increased probe current and beam stability. 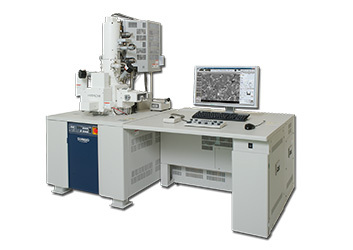 The members of the SU8200 family offer a variety of stage, specimen chamber and signal detection system configurations to meet the wide range of customer-specific needs for indispensable ultra-high-resolution microscopy in nanotechnology fields such as semiconductors, electronics, catalysts and other functional materials, biotechnology, and pharmaceuticals. "Low loss BSE" delivers signals from very shallow specimen depths (~ a few nm), and those signals can be acquired by an energy filtered BSE detector such as SU8200's "TOP detector". 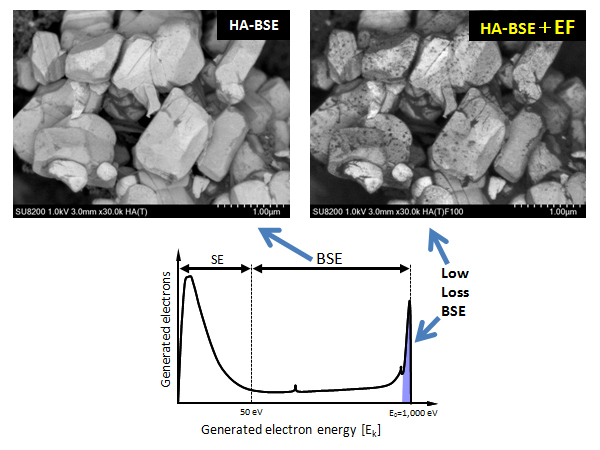 Through "Low-loss BSE" detection, the right image shows the TOPMOST material information.